Those who can secure admission to a state university in Sri Lanka consider themselves a lucky lot. That is because the state university system has a few places far short of the number that qualifies for admission at the GCE (Advanced Level) Examination. According to the official data, the lucky lot is 1 to 6. The large majority of others are in a quandary as to what they should do to have their aspirations for higher education fulfilled. A few of the rest have to find educational opportunities at universities abroad at a great expense. Some others switch over to professional education in accounting, computing or marketing. These two categories are the really lucky lot since they could acquire the necessary qualifications faster than those at state universities and secure the available few places in the very thin job market. A large segment has to be content with diploma level education at a technical college. A great majority of students have to give up hopes of higher education altogether and continue to search for jobs which are scarce in the market. Since only the top-scorers at the exam are admitted to a university, students regard themselves as the crème of the country’s top young brains. Hence, they demand society to treat them as an unquestionable elite group. This view is being subscribed to by the academia, media and the public at large. Since it is the crème that is admitted to the university system, one might expect that what the system would produce would be better crème than what is taken in. However, this judgment has to be made not by the academia or the students. It has to be made by prospective employers who have to make use of the skills which these students have acquired while going through the university system. As I have argued in a previous article in this series (available at: http://www.ft.lk/w-a-wijewardena-columns/How-to-groom-intellectuals-for-the-future--Two-contrasting-views-from-Thailand-and-Sri-Lanka--Part-1/885-648278), students who join an educational institution go through a prescribed study program and subject themselves to the changes that are inflicted on them during the process. Hence, they are simply ‘throughputs’ that go through the system and pass out at the end. As a result, what comes out from the system as graduates is the same person possessing a higher level of skills and a changed mindset. Employers hire those graduates in the hope that they could produce a good or a service which they can sell in the market at a price. From their point, the graduates passing out from universities are ‘ready-to-use human resource units’. ‘Ready-to-use’ means that once they are placed in jobs they should be able to use their acquired skills to produce a good or a service immediately with no need for further training. A resource means that once they are employed, they should be able to produce an output that can be sold in the market. The normal microeconomic principles involving the diminishing marginal productivity are also applicable to them. There are certain qualities which employers expect of graduates if they are to become a resource which is readily usable. First, they should have right attitudes to work in an organisation. Those attitudes should enable them to absorb the cultural values of the organisations they join and work for the furtherance of its goals. If they are hard-lined and unable to appreciate those cultural values, the result would be the emergence of continual conflicts that lead to low productivity, low output and finally, low profits. Such an organisation is unable to withstand the competitive onslaught of competitors will go out of business pretty soon. Along with the bankruptcy of the organisation, the graduates too will lose their jobs. Hence, the employers normally give a very high weight to the attitudinal base of the new recruits. Second, they should have ability and willingness to learn. Knowledge becomes obsolete pretty fast due to the introduction of new technology and changes in the systems. One good example is the displacement of double-entry bookkeeping by the new distributed digital ledger system known as the Blochchain, the operating system governing the new digital currencies, mainly, Bitcoin. As such, employees should be ready to throw out old knowledge and equip themselves with new knowledge. This applies not only to work routines but also technical skills which they should have in order to deliver their output. Employers love to hire people who are ready to invest their time, money and efforts in new learning. Third, they should have an extraordinary capacity to work with others to produce outputs in teamwork arrangements. One is unlikely to work as an effective member of a team unless he has good social skills that help him to have good interpersonal relations with others. Modern outputs are not individual-based but produced by the combination of a large number of people. Fourth, a modern worker, since he or she has to work with others, should have excellent communication skills, both verbal and written. One should be able to communicate at least in one language. However, in order to learn of new developments, he or she should essentially have competence at least in one international language. Fifth, workers should be creative workers who are able to think out of the box and come up with solutions to the problems they face. This is the essential quality which education should develop in those who go through the system as throughputs. At universities in Sri Lanka, the academics attached to them, parents and policymakers have high hopes that the system will produce the human capital needed by society. Students who consider them as the crème of the brains to enter the university with the same high hopes. However, one particular ritual which is practised by a section of the students religiously has shattered those hopes beyond recovery. That is subjecting the fresh students to mental, physical and economic torture on a mass scale under the guise of orienting them to the new life at universities. In common parlance, this is known as ragging. 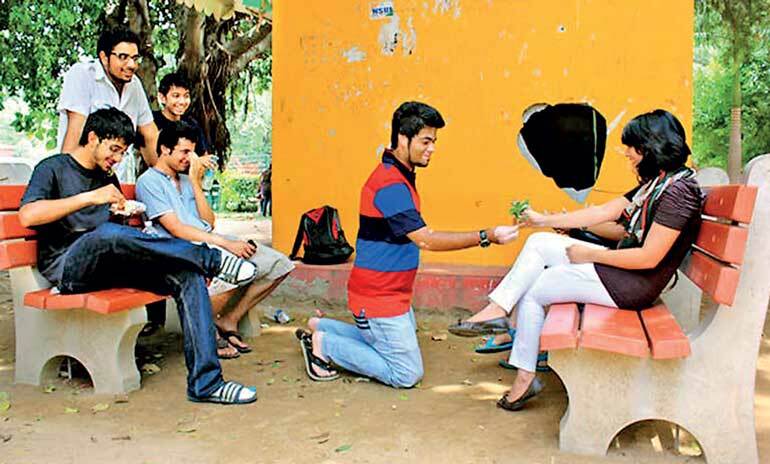 Ragging is a sub-cultural practice by students in Sri Lanka’s universities. It is built into their DNA in the sense that what they have learned from their seniors is passed on to their junior batches. Accordingly, those students who become seniors will rag the new students who enter the university in subsequent batches. Thus, it is repeated year after year and it survives like a religious cult within the university system. Sri Lankan universities have been modeled on British universities and many believe that the ragging practiced in Sri Lanka has been adapted from them. British universities too have a system of ragging but it is completely different from the system being practiced here. In the British universities, it is the senior students who are being ragged mostly and not the freshmen as is the case in Sri Lanka. I had the experience of observing the ragging that took place at the University of York, UK in 1977. There was a ‘rag week’ and it took place not in September when the new students were admitted but in February when the Spring Semester started. It was organised by the university’s student union with deliberate pre-planning done with full cooperation of the university authorities. The details of the rag week organised by the University of York Student Union in 2016 have been given in the university’s official website and they are not different from what I had observed nearly 40 years ago (available at: https://www.yusu.org/opportunities/rag). The rag week was announced by the Vice Chancellor and it consisted of a number of events aiming at raising funds for a good cause. Students were coaxed to participate in the events voluntarily. There were social events, entertainment in the nights, sports, challenge walks, numerous fund raising campaigns that enable the students to support a charity at the end. Thus, there were dancing, singing, martial art demonstrations, food fairs and various other activities hosted by students coming from different countries and cultures. Students in all the four years participated in these events voluntarily. The challenge for them in 1977 was to build a hypothetical wall of 25 pence coins from the university’s Library Gate to the York City Gate which had a distance of about 4 km. The student union had calculated the amount of Sterling Pounds needed to build this hypothetical wall when standing coins are placed touching each other through this distance. Then, targets were given to each student group to raise funds. I recall that by the end of the week, students at the university managed to raise more than the needed amount to erect this wall. At the end of the week, at a function attended by all the students, the Vice Chancellor congratulated them on the successful completion of the rag week and the raising of funds for donation to a charity. In 1977, it was a donation to an old people’s house in Yorkshire. But in 2016, as the website under reference has pronounced, it had been numerous charities for which each college of the university had to raise funds for giving support. If the objective of ragging is to help students to fight away shyness, bring forth their hidden talents and build interpersonal relationships, this type of cross-cultural events done voluntarily serve that purpose best. In the rag week, there is an event for every student. It is open, fully sponsored by university authorities, voluntary and meant for a good cause. All universities in the UK have similar rag weeks organised with sponsorship of universities by student unions. Since the cult practices in the subculture at Sri Lanka’s universities cannot be eradicated through punishment as suggested by some, this is a good practice which Sri Lanka’s university authorities could consider adopting. Instead, the ragging practised in Sri Lanka has caused young students to become mentally tormented and left them with experiences that will torture them for the rest of their lives. Sri Lanka’s universities have started to give instructions to students in English medium from the first year onward. However, the proficiency of students in English, as demonstrated by their performance at the Common English Paper at the Advanced Level Examination, has been far from adequate. A senior don at a state university has confided in me that his university usually gets the students who have scored the highest at the examination. Yet, half of them have failed the Common English paper which he says is not a very tough examination. Only about 13% of the students have got more than 70 marks. Therefore, the university has arranged to conduct special English classes for the students to enable them to overcome that deficiency within the shortest time possible. He says that in countries like Russia, Germany and China where the medium of instruction is in their respective mother tongue, foreign students are taught the language of instruction within the first six-month period. Students after following those language courses are able to follow the lecture programs without difficulty. Hence, the first six months are the most crucial for students to learn English. However, according to this academic, students are subject to mass ragging during the first three-month period. The objective of ragging has been to break the in-built personality of the student and make him obey the orders of the raggers without questioning. Those raggers are affiliated to a radical political party and the objective of ragging has been to make the fresh students follow the orders of the top leadership of that political party. Though the first six months are crucial for any student with language deficiency to overcome the same, according to this academic, they are not in the right mind to follow those English classes. It is the students who come from remote areas who fall victim to this mental torture. A few students are able to overcome the deficiency either because they have family backgrounds or because they come from schools which provide a good English education. The students who are left out are unable to recover from the loss throughout their university career. Accordingly, only a few will succeed in becoming a better lot. It makes the creativity among university students exclusive rather than inclusive. Ragging is a criminal offence in Sri Lanka. Yet, it is practiced openly with total impunity. Since the authorities keep a blind eye, fresh students have no choice but to allow themselves to be ragged by seniors freely. Though the radical political parties attain their objective of creating a silenced student population, that silence has destroyed the creativity of a generation.